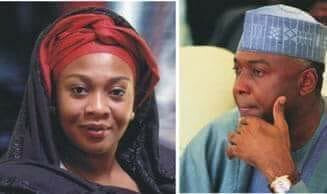 Reno Omokri took to his Twitter handle to berate the sister of Senate President Bukola Saraki, Gbemi, for mocking her brother over the loss of his senatorial seat. Saraki lost the Kwara Central Senatorial seat elections to Ibrahim Oloriegbe of the APC in the elections which held this Saturday. Gbemi is an APC member and a staunch supporter of President Buhari. Herself and her brother, Bukola, are political rivals. But they wanted to Grow Nigeria?